Beauty in cars is often wrongly confined to styling and bodywork when there's so much to see that is hidden away under the skin. Here are the ten automotive components Jalopnik readers think most deserve recognition and praise. What car part should hang in a museum? Why it's deserving: The Mclaren F1 tub was the first road car to be built out of that most alluring material, carbon fiber. It fills in the flowing curves of the car's body, yet also cuts violently away for the assemblies at the rear. It is rigidly ugly in places, gorgeous in others. Above all, it is a landmark piece of engineering that may stand as the starting point for all car design in the future, so long as lightweight remains important and the cost of the material goes down. Why it's deserving: There is no designed-in art in a Formula One steering wheel. You just get a piece of carbon fiber, stick all the buttons and knobs you can on it, and fit some custom grips on the side. The beauty is in the speed, the technology, and the kind of pop art cool of all those completely functional brightly colored, labeled dots. Why it's deserving: It's the archetypal wheel. Strong, functional, beautiful. Why it's deserving: The manual transmission deserves a place in a museum, as a reminder of how much work used to be involved in driving, as well as the level of communication and interaction between the human driver and the mechanical automobile. Of all these transmissions, it is the open-gate shifter, particularly of very emotive old Ferraris that stands above the rest. This one, in a 1957 Ferrari 335 Sport is both rigidly inhuman, and somehow quite organic at the same time. Why it's deserving: Strip this Lamborghini suspension of its brand, its heritage, its price, its reputation and you still have a beautifully elegant piece of design. It is required viewing that you check out the full investigation of the suspension over at InsideLine's suspension walkaround, where you can see each machined part in gleaming detail. Why it's deserving: These little machined triangles don't just have heritage as winning components of the 1991 24 Hours of Le Mans, but they have a beauty all their own. They're an automotive oddity, an amazingly simple-looking alternative to the piston engine that never really caught on. Why it's deserving: If there is one example of the awesome capability of modern machining and computer-aided design, it ought to be this incomprehensible array of gears and clutches, the Doppelkupplungsgetriebe. It stands on the very cusp of postmodern component design, a final mechanical marvel before everything is electronically actuated and 3D-printed. Why it's deserving: The Type 35 was once regarded as the winningest car of all time. Eight trillion autocrosses later and that title probably goes to the Miata, but the mechanical beauty of the Bugatti remains. You could hang just about any part from the car in a museum, from its hollow front axle to its iconic and pioneering alloy wheels. The 2 liter straight eight, though, with its flat planes, roller bearings and 5,500 rpm redline (in the 1920s!) that deserves the most attention. Why it's deserving: Have you ever seen these twin Eaton TVS rotors? It's hard to imagine that they do anything but look otherworldy and beautiful, let alone help crank out over six hundred horsepower. Why it's deserving: The bundle-of-snakes exhausts of '60s race cars remain the most beautiful, functional, brutally powerful piece of automotive engineering the world has yet seen. 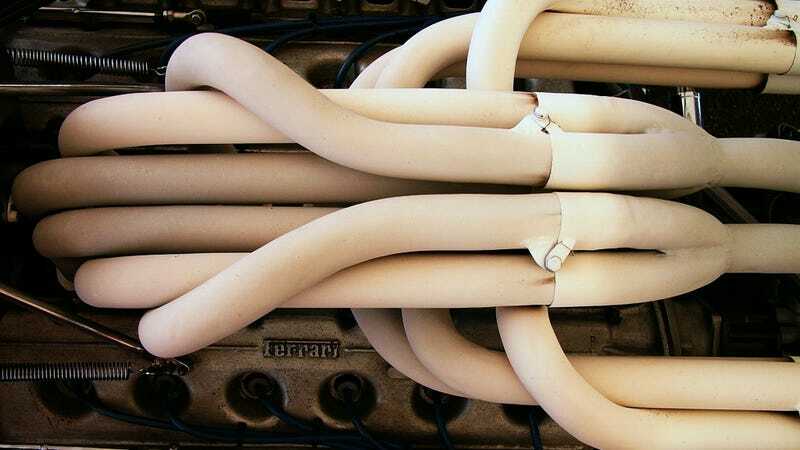 These Ferrari exhausts, shot at the 1969 Frankfurt Auto Show, are straight awe-inspiring.